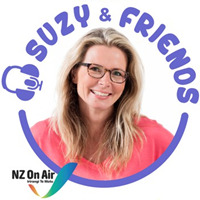 Hosted by legendary kids' television host Suzy Cato, Suzy and Friends features a mix of new and classic stories and songs, plus: features, reviews, competitions, interviews and fun things to make and do. 'Kids Just Like You', where the team go out and record children's responses to questions. 'Va'a and Maia' is a serial about two 10- year old kiwi kids who go on great adventures in everday places. There are children reviewing books and movies, telling jokes, chatting and much more.